Andrea Kelly (’16) always wanted to study law but didn’t think being a lawyer was for her. She chose journalism instead, starting her career more than a decade ago at the Arizona Daily Star in Tucson before becoming a producer with Arizona Public Media. Yet, she never lost her interest in the law. When she learned about the Master of Legal Studies (MLS) program at University of Arizona Law, she knew it was a perfect fit. The one-year degree, offered both on campus and online, gives students a foundation for working with and understanding laws, regulations and the legal system and teaches legal analysis and communication skills. It covers general legal knowledge and also offers 11 concentrations in areas such as compliance, business, mining and tax. Kelly acknowledges that working full time and pursuing her MLS degree part time was a lot of work, but says she found the experience enriching and worth the time, energy and effort. Kelly took all but one class in person, as she preferred the classroom setting and the opportunity to interact with her professors and other students. As a journalist, Kelly found the MLS degree has helped her do a better job of informing the public. “Many of the most important parts of public life touch the legal system, so having an education helps me translate or explain the kinds of decisions that shape so much of how our world works today,” Kelly says. While the MLS was an obvious fit for her own career, Kelly thinks it is a versatile degree that can be applied in a large variety of professions. Kelly graduated in 2016 and last August was promoted to assistant news director at Arizona Public Media, where she manages a team of 10 reporters in producing daily and weekly radio and television shows on culture, arts, current events and public affairs. She says the degree gave her exactly what she wanted: enhanced knowledge and skills, plus stronger career prospects. 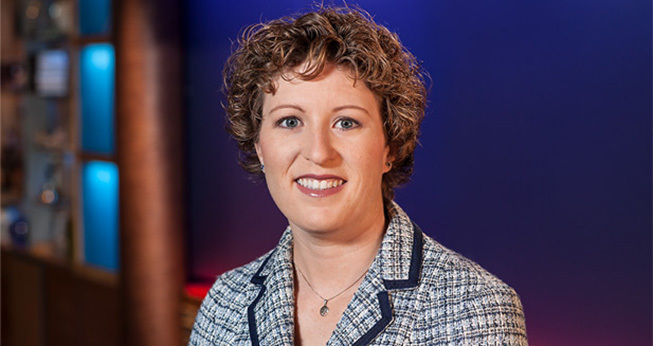 A past winner of multiple regional awards from the Society of Professional Journalists and the National Academy of Television Arts and Sciences, Kelly was also one of Tucson’s “40 Under 40” winners in 2017.